Using it is very simple: just pick the language of choice, and the page (text and some attributes like alt and title) will be translated. Pick the first entry in the list to see the original language again. This all happens inline by dynamic DOM manipulation, without having to reload the page. I tested it on Chrome 2, Firefox 3.5, Opera 10, Safari 4 and Internet Explorer 6 and 8. So far, it seems to work for all these browsers. Personally, I feel that the user experience you get with this widget is superior to what you would get with the google translation gadget. In addition, it is pretty easy to to configure the Translator class . Another thing I haven't focused on just now is integration with frameworks - on the contrary I made sure you can use it standalone. But in order to do that, I had to write a few methods to facilitate DOM manipulation and JSON parsing, and its almost certain you will find functions like that are already in your framework. Anyway, readers, I'd like to hear from you...is this auseful feature on this blog? Would you like to use it on your own blog? If there's enough people that want it, I will make it available on google code or something like that. 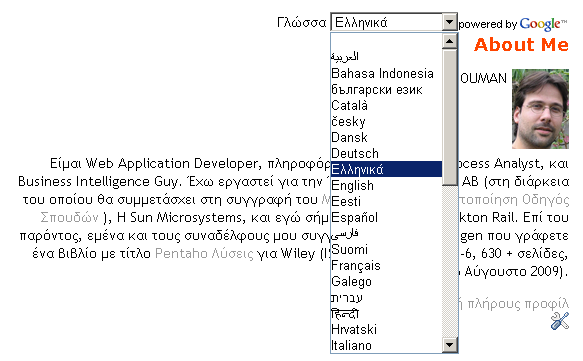 Yes, it`s indeed easy to implement but the quality of the translation is really poor. Dunno if Google Translate is good solution for this kind of thing. thanks for your comment. My I ask which languages you tried, and what your native language(s) are? I'd really appreciate that information. Regarding the translation quality: I get varying results. I noticed that my English prose doens't translate very well back to my native language (Dutch). But I also noticed some texts from the wikipedia that seem to yield pretty reasonable translations. I am hoping that it is possible to adapt a simpler writing style to increase the quality of translations. That may seem like a backwards way of thinking - why adapt human behaviour and not the translation process, right? But sometimes you have some text that you just want to make as accessible as possible for as many people as possible. In these cases, I would certainly consider adapting my writing style if that would give me translations that are decent enough for about 80% of the time. You should modify this widget to use the Worldwide Lexicon (www.worldwidelexicon.org/api). WWL is a collaborative human/machine translation system that allows users to edit and score translations, and uses machine translations as a fallback. See also our universal translator for Firefox, which makes browsing foreign language sites seamless and automatic (it kicks in to translate pages when it senses a page is in another language). I can be reached as bsmcconnell@gmail.com to discuss further. Would love to have a widget like this to distribute with our open source release.